Lăng Cô, Thua Thien – Hue, November 8, 2018 – Ton Duc Sau needed no second invitation to once again show off his affection for Laguna Golf Lăng Cô. Rising to the challenge presented by the award-winning, Nick Faldo-designed course, the six-handicapper retained his title in the second edition of the Laguna Lăng Cô Invitational. Upstaging his rivals in the 125-strong field, Sau produced an outstanding performance, carding a one-over-par 72 in the 18-hole stroke play event – no fewer than eight strokes better than his winning total in the inaugural tournament in 2017. A resident of Hue, the 45-year-old Sau took up golf in 2006 and plays regularly Laguna Golf Lăng Cô, named Best Golf Resort Asia – Vietnam at the Golf Digest’s Editor Choice Award 2018. As the gross champion, the Laguna Golf Lăng Cô member was richly rewarded for his latest winning efforts, his prizes including a 55-inch LG UHD Television, a Puma Golf Bag, a three-night stay at Indonesia’s Banyan Tree Bintan and a gift from Diamond World. There were also attractive prizes in the Ladies Division, won by 24-handicapper Park Young-keang, whose gross 95 translated into a net 71. The professional manner in which the Laguna Lăng Cô Invitational event was staged and the immaculate conditioning of the par-71 layout sculpted by six-time Major champion Faldo and home to the prestigious annual Faldo Series Asia Grand Final were widely praised by participants, who were attracted from all over Vietnam and beyond. Calver also thanked the main sponsors: Vietnam Airlines, Cobra Puma, Titleist, Diamond World, Club Car, LG and FLC Quang Binh. “We appreciate the generous backing of all of our sponsors. Without their support, we would not be able to host events such as this,” said Calver. 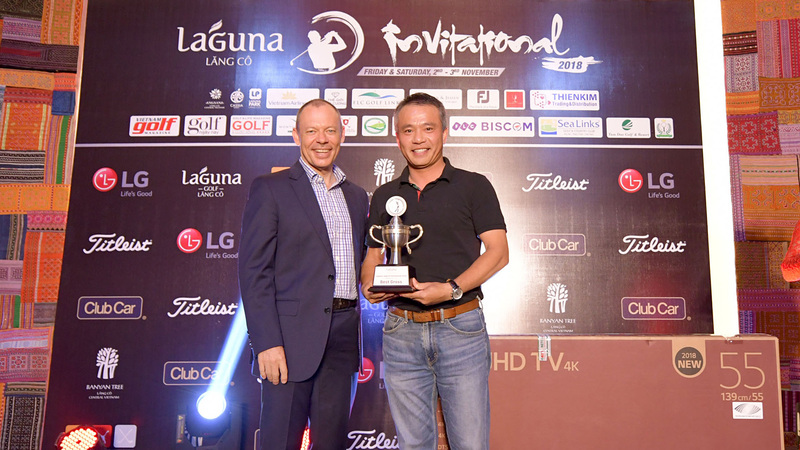 Spectacular prizes were on offer at each of the four par-three holes – a diamond ring from Diamond World; a round-trip business class ticket on Vietnam Airlines; a Club Car golf cart and 35-year Membership at FLC Quang Binh as well as a US$5,000 cash prize from Laguna Golf Lăng Cô. Although those prizes went unclaimed, there were plenty of takers for the barbecue stations at the fifth, eighth and 14th holes. There were also many happy contestants from the lucky draw with prizes including nine-month membership cards for Laguna Golf Lăng Cô and accommodation vouchers at Banyan Tree Hill Villa and Lagoon Pool Villa.